It shocked me too! Believe me! The 810 plan in Richwoods Country has raised in price $30,000 since the first day that it was in pre-sale in March with Landon Homes. This increase is exactly what I have been trying my hardest to explain to my clients with the rock bottom pricing that Landon had released in their high-end luxury homes. I had a handful of clients jump in early, and I know they will live me know. One of my clients bought an 810 at $438,000 in Richwoods Landing and their biggest concern was if it would be a good investment. Their financial advisor told them it would not be, and obviously I couldn’t put enough emphasis on the opportunity!!!! And what do you know, now it’s at $468,000. Hmmmmmm?!? This is after looking into traffic, the other builders pricing and anticipation of the amenity center breaking ground. Wait until the second wave of interest when the huge amenity center is erected. Congratulations on all of you taking advantage and listening to me on getting in early!!!! 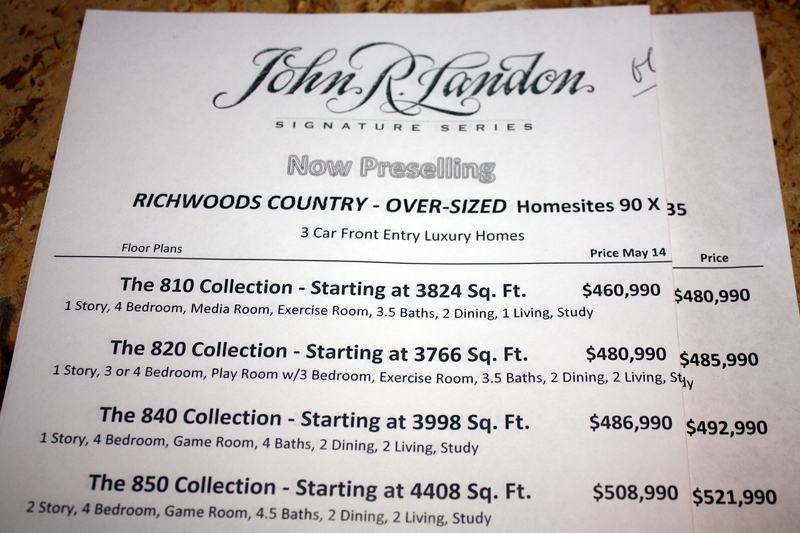 For more info on Landon Homes in Richwoods click the link or call Brad Holden directly at (469) 733-2723.